This 5 Piece Pruning Kit from Tinyroots comes with the three most popular Bonsai tools from a top-quality manufacturer. 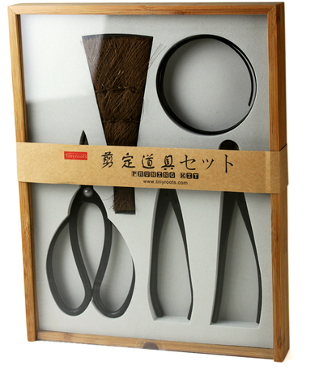 Traditional "Butterfly" Shaped Bonsai Sheer - The "Butterfly" shaped pruning shear is the most popular Bonsai tool on the market. They’re very easy to use, exceptionally powerful because of their unique design and have plenty of room in the handles to accommodate gloved fingers. When it comes to trimming roots, twigs and branches easily and precisely, Butterfly Shears are essential. Concave Cutter - The concave cutter is a powerhouse when it comes to branch and root pruning, but it's also highly precise. The blade is designed to take a concave bite out of the trunk when removing branches or limbs, and that allows the wound to heal with very little scarring. 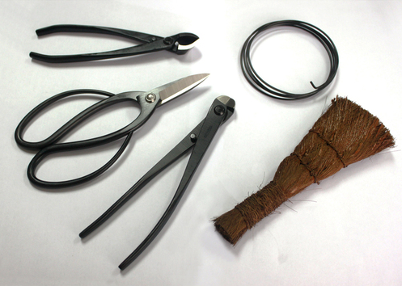 Long Handled Wire Cutter - This long handled wire cutter is designed to allow wire to be cut away from your Bonsai tree without over-biting into the tree itself. This tool has a slight curve to the handles and provides perfect handling for precision use, making cutting wire effortless. Genuine Hemp Broom - These brooms are traditionally used to brush away small debris, even out top soil, dust off work benches, pottery and other clean-up tasks.